I struggled with how to close out the year here with a special feature. I haven't done a year-in-review piece in at least a few years and likewise for future-looking predictive articles. I haven't felt the inspiration for this to be the year that I return to them. In the last month of beer delivery packages from breweries, my path to bringing a year of beer at The Brew Lounge to a conclusion all of a sudden became clear. One of my favorite "discoveries" while traversing the vast state of Pennsylvania for my Beer Lover's Mid-Atlantic book was found in the small western PA town of St. Marys. The town is roughly 2 1/2 hours from both Erie (to the NW) and Pittsburgh (to the SW) and sits along the eastern edge of the Allegheny National Forest. 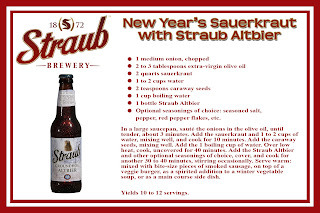 Straub as been a fixture there since 1872, is seven generations deep into the family-run business, and made a significant financial investment a few years back in modernizing equipment, updating recipes, and investing in sales and marketing. I was taken by their four-story, gravity-dependent brewery, its "Eternal Tap", and the drive-up beer store fronting the brewery. And, obviously, their beers as well. It's why I choose to feature them here just prior to the holidays. As you go about entertaining during the holidays, equally challenging to providing a meal to a group of people with different preferences is the task of having a variety of beverages. 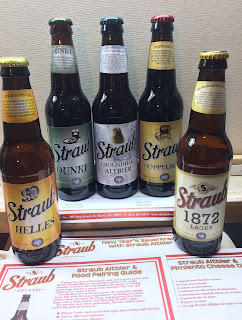 I covered Straub in the current issue of Ale Street News and coincidentally, they sent a Legacy Sampler along with the seasonal Groundhog Altbier. In it was a crisp, clean, and refreshing Helles Lager (5.5%), a slightly heftier 1872 Lager (5.4%), a roasted malt Dunkel Lager (5.2%), a sweet-tinged Doppelbock (7%), and a malty smooth Altbier (5.4%). 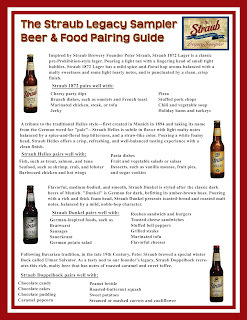 Not only does this lineup of beers satisfy a variety of tastes, but they'll have little problem finding their way onto a beer-food-pairing-friendly table as well. The brewery (and marketing department) is keen to pick up on this. 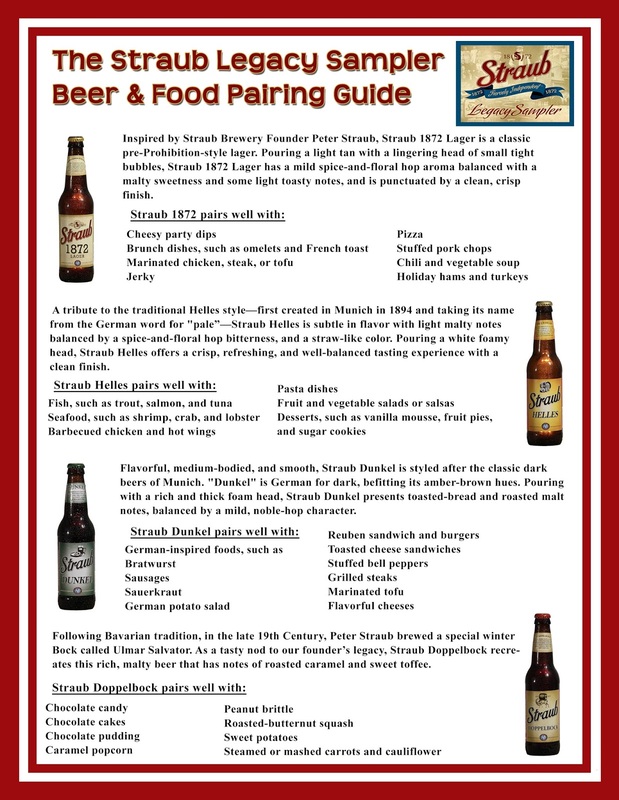 Straub publishes a "Beer & Food Pairing Guide" — a set of recipes and suggested pairings for each of the beers. 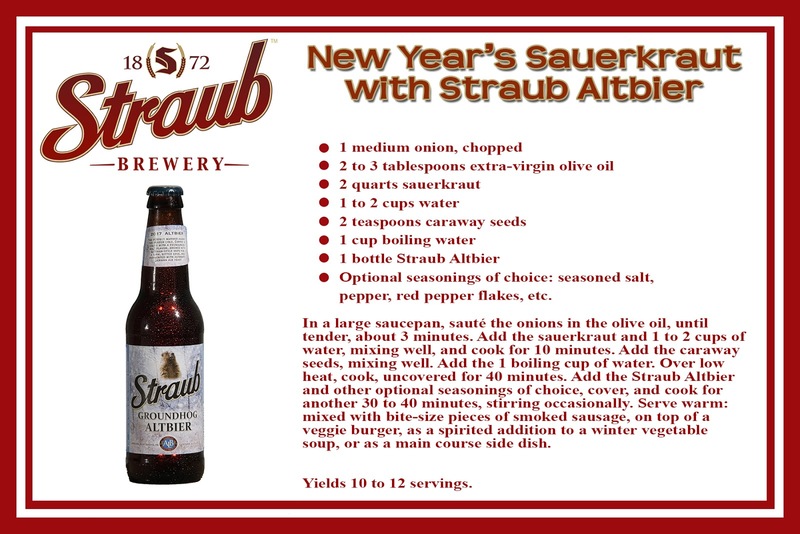 One I'm looking to try over the holidays is the "New Year's Sauerkraut with Straub Altbier" recipe with, of course, a couple accompanying Altbiers which I presume should go quite nicely with the traditional meal of pork, sauerkraut, and mashed potatoes. In addition to the Legacy Sampler and the Summer Sampler (Pilsner, Hefeweizen, Vienna Lager, and Kolsch-style), the IPL (once a seasonal) stands out as one of their best year-rounds. 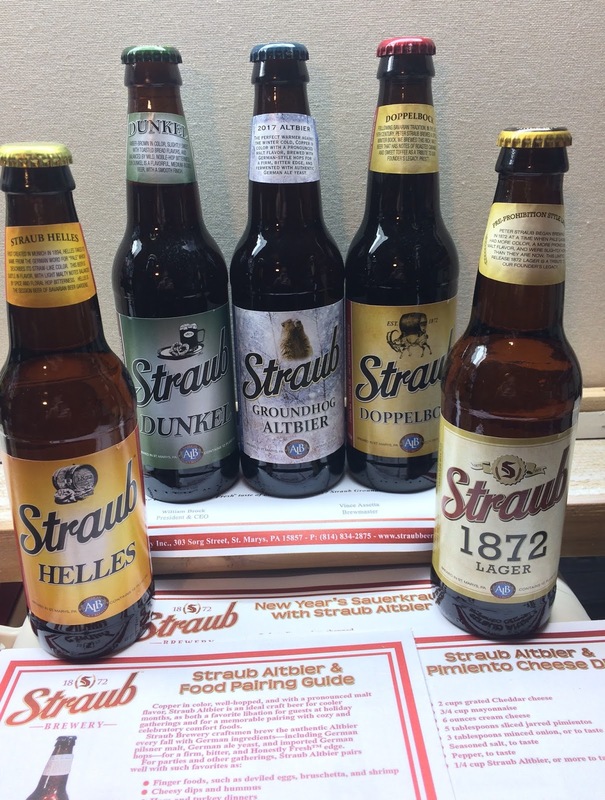 As you should be able to tell, I'm bullish on both the history and the rebirth of Straub. It's a brand that, here on the eastern side of the state, we're seeing more of (due to the aforementioned investment in growth) and that is a very good thing. As the amorphous "craft" segement of the industry continues to involve in wild, wacky, and sometimes confounding ways, my hunch is that it will become more important than ever to come home to unapologetically and uncompromisingly well-made classic styles of beer. That's what Straub is putting in front of us. May your holidays be filled with plenty of great tastes; Cheers!